ATLAS STRENGTH: Updated and improved, the Atlas returns as a refined staple of the Union Binding collection. 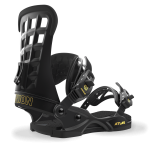 Duraflex ST Nylon, ExoFrame Straps, and a canted base are just a few of the insane features of this all-terrain "do it all" binding with a value second to none. 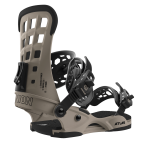 CANTED POWER: Ideal for riders using a wide stance, Canted Gas Pedals on the Atlas supply extra leverage for ollie power. Canting also allows the ankle and knee joints to be aligned, alleviating pain.